Data centers have already become an important part of the infrastructure that supports Japanese society and economy. It is estimated that in 2017 the demand for data centers in Japan will experience major near-term growth, driven by the growing adoption of cloud computing, according to CBRE (Bringing the Cloud Back to Earth). Japan is one of the wold’s main locations when it comes to the IT services eg. Data centers. The Japanese DC market is one of the fastest developing ones. Why is that so? Japan is a major economic power with the world’s third-largest economy by nominal GDP. One of the biggest conveniences of living in Japan is how modern and technologically advanced this country is. An omnipresent Internet is not an exception here. According to Statista’s statistic on the internet penetration in Japan from 2000 to 2016. It states that Japan is at 92 percent of the Japanese population accessed the internet in 2016, up from 78 percent in 2009 and it places Japan on the 4th position in the world. Its household penetration turns around 86 percent while business penetration is at 99 percent for businesses with plus 100 employees. Anoter statistic shows the countries with the highest average internet speed during the first quarter of 2017, measured in Megabits per second. The global average internet connection speed was 6.3 Mbps while average internet speeds in Japan turn around 20.1 Mbps. 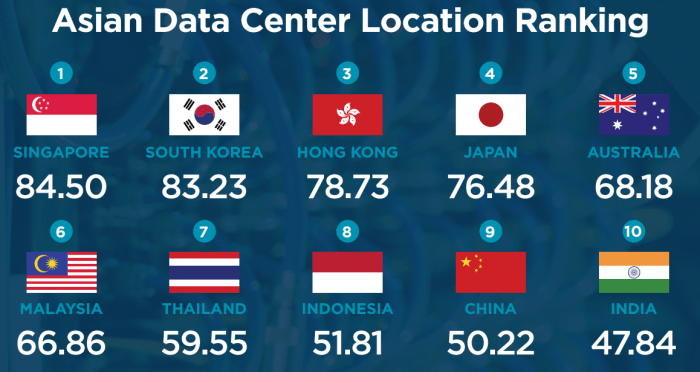 The Asia-Pacific data center services landscape is dominated by telecommunications companies/carriers such as NTT Communications (Japan), China Telecom (China), Singtel (Singapore), and Telstra (Australia). Telecom companies own the underlying network infrastructure, which allows them to have full control over their offerings – from an IT service delivery as well as from a connectivity perspective. Thus they benefit from the ability to offer an end-to-end proposition to customers comprising data center services, connectivity, cloud offerings, and value-added services such as managed security and disaster recovery, among others. As demand for data center services in Asia-Pacific grows, facility pure-play vendors (e.g., Digital Realty, US; Equinix, US; Global Switch, UK) and carrier-neutral data center providers (e.g., Fujitsu, Japan) have also tapped on the growth trajectory by building new data center facilities or by expanding existing ones. Frost & Sullivan considers pure-play public cloud providers such as Amazon Web Services, Microsoft Azure, and Google as Infrastructure-as-a-Service (IaaS) service providers. Thus these vendors are not considered in the competitive landscape for the purpose of this report. Fujitsu and Equinix, with market shares of 5.4% and 5.3% respectively. The Asia-Pacific data center landscape is highly fragmented, as increasing data sovereignty concerns have given rise to dominating vendors in the respective countries. These vendors include PCCW Global (Greater China), Telkomsigma (Indonesia), AIMS (Malaysia), VADS (Malaysia), and Telin (Indonesia). As such, while these market participants are not plotted in the Frost IQ Matrix because they fall short of meeting the selection criteria, they are notable vendors in their respective countries. More details of key country-specific vendors to watch out for can be found in Section 6: Other Data Center Service Providers to Watch. Twelve major data center service providers in Asia-Pacific fulfill the selection criteria and are plotted on the Frost IQ Matrix. Four data center providers, NTT Communications, China Telecom, Fujitsu, and Equinix, are in the Champions’ quadrant. NTT Communications leads the industry with the highest revenue market share as well as growth strategy in Asia-Pacific. It is well-positioned as the leading vendor, notably for its comprehensive portfolio of offerings, presence in the region, as well as maturity of channel partner ecosystem. Seven other data center providers are in the Challengers’ quadrant. They are Singtel (Singapore), KDDI Telehouse (Japan), Telstra (Australia), STT Global Data Centres (Singapore), Global Switch (Australia), Digital Realty (US), and CenturyLink (US). Singtel leads these seven service providers in terms of revenue market share. However, Telstra emerges as the vendor within the quadrant with the strongest future growth strategy, driven by its integrated data center portfolio bundled with value-added services, as well as future expansion plans in Asia-Pacific. WHY LOCATE YOUR SERVER IN JAPAN? Japan is a major economic power, with the world’s third-largest economy by nominal GDP. As leading nation in technology, machinery and robotics, the country’s research and development budgets are among the largest in the world. Japan is also home to one of the most advanced mobile telecommunications markets in the world, with sophisticated consumers who use their devices for a wide array of activities. The information and communication technology (ICT) industry is the largest industry sector in Japan with a market scale of USD 1.2 trillion (as of 2011). Japan’s Ministry of Internal Affairs and Communications aims to double the market to USD 2.4 trillion by 2020. There were 101,228,736 internet users in Japan (representing 79.5% of the population) at mid-year 2012 making it the country with the 4th largest number of internet users in the world after China, USA and India. Into 2013, there were over 130 million mobile subscribers in Japan with around 97% of these using 4G services. The data center market in Japan has experienced significant growth in 2013, with the market expected to reach near 70,000 million yen by the end of 2015. The broadband access speeds vary drastically across countries in Asia-Pacific, which could either drive or inhibit the adoption of IT services such as cloud computing. As the data center ecosystem becomes more complex, demand for data center infrastructure management (DCIM) tools also increases. This is especially prevalent in more technologically-advanced countries such as Japan. DCIM tools allow data center managers to optimize data center infrastructure and operations with increasing visibilities, by understanding usage patterns of resources, and optimizing the use of power and cooling. Japan DC infrastructure is stable, fast and one of the best in the world. Technological advancement puts Japan in one of the top positions on the Asian DC market along with South Korea and China. Do you want to work with the top tech developed countries on this planet? Check out EhostIDC dedicated servers in Japan and stay tuned as we are launching a brand new DC in Akita! This entry was posted in General, IT and tagged 2017, 2018, 4G, 4G coverage, administration, ai, akamai, akita, algorithms, algorytm, algorytmy, Alibaba, Aliexpress, AlphaGo, AlphaGo Zero, amazon cloudfront, amazon webservices, AMD, America, android, antivirus, antiviruses, applications, artificial intelligence, asia, asia-pacyfic, atlantic, aurora, automobile, bandwidth, beginner, big data, bigdata, bigthing, bing, bitcoin, bitcoin mining, bitcoins, block chain, blockchain, boost, boost your website, boot, booting, BTC, bug, calbe, car, careful, cars, cash, cdn, centrum danych, chart, China, cloud, cloud-based firewall, cloudflqre, colocation, company, comparaison, comparing, compartive, computer, computers, computing, confusing, congused, connection, Content Delivery Network, cryptocurrency, CSO50, cybercrime, cyberspace, cyberwar, dane, Data, data center, data storage, database, Datacenter, DC, DC market, dead, dedicated, dedicated servers, deep thinking, deeplearning, deepthinking, defence, die, difference, digital, display, DNS, driverless car, e-commerce, ecology, Ehost IDC, ehost international data center, Ehost Internet Data Center, ehostidc, EhotIDC, Europe, experiment, FACEBOOK, failure, fast, fastest, fiber, finland, Firewall, Ford, forecast, France, game, gamer, gaming, geek, Germany, Go, going green, goodle, google, google search, gracze, groth, gry, hacker, hackers, hacking, happiness, hardware, hebergement de donnes, hi-tech, history, hitech, hola cdn, host, host-based firewall, hosting, hybrid cloud, IDC, india, Indonesia, innovation, inphography, Intel, interesting, internet, Internet of things, invention, IoT, IP, iPhone, iPhone X, IPv4, IPv6, isp, IT, Jack Ma, Japan, jaywalking, job, kaspersky, kernel, keyboard, keyboards, kim jong un, KIM JONGUN, kimjongun, knowledge, Korea, korean data center, krack attack, krackvirus, laptop, letancy, linux, list, LTE, Ma Yun, machie learning, machine learning, machines, Malaysia, malware, managed, MAREA, market, marketingautomation, Mb / s, middle east, mining, money, monitor, monitors, monitory, MySQL, NEC, nerd, net, network, network-based firewall, networking, nety, new data center, news, no net, node, nonet, north korea, northkorea, Norway, NSA, numbers, ocean, omg, Operating system, OS, outage, ovh, perception, ping, planetsimon, plans, Poland, price, problem, process, processor, processors, protection, pyongyang, rack, raport, review, rich, rifle, rip, robot, Robotics, Robots, Russia, russians, science, screen, search, search engines, security, security solutions, secutiry solutions, self-driving car, seoul, server, servers, serveurs, serveurs dedies, smartphone, sophia, South Korea, speed, spy, spying, srash, srever hosting, stealing, stocks, stolck, subsea cable, supercomputer, system, Taiwan, tech, technology, techy, test, Thailand, the fastest computer, top, top500, traffic, trick, turtle, turtles, Uber, UK, under water, US, USA, user, vehicle, video, virtual money, virtual private network, virus, Volvo, VPS, vs, WAF, Waymo, web, web page, webpage, website, wifi, windows, windows phone, windowsphone, wow, youtube, youyube. Bookmark the permalink. Blockchain Technology in Layman terms. What is the technology that will change the world?